Popovers remind me of my cousin Wendy, and of one of the sweetest periods in my life, when I was living and working in San Francisco. It was a strange time: at once unsettled and upended, yet bearing inexorably towards a very pragmatic end. I was commuting between San Francisco and New York with stopovers in the south to see Hubby, who at the time was The Fiancé. As we were to be married in Napa, being in San Francisco made it easier to make runs into wine country to plan and tweak the wedding. I have very fond, very happy memories of being in San Francisco and not a day goes by that I do not miss being there. The city offered so much and strikes a chord in me that no other city before or since has been able replicate. If Paris is feckless and spirited and London my soul's home and haven, then San Francisco is indelibly magical, misty and foggy, all romance and sensory overload in one sophisticated package. I have so many beautiful wonderful memories associated with this city; of exploring it with Hubby; of eating in so many spectacular restaurants; of hanging out with beloved family; of traversing its streets with friends and engaging in earnest conversation. Most of my time when I lived in the city was spent in Wendy's company. I was staying at her home in Sunnyside which was high on a hill and had a great view. One of my favorite escapades involved looking at the long, unmoving line of traffic on I-280 from her balcony and deciding not to go to work until later that afternoon. We elected instead to settle in on the couch and watch The Haiku Tunnel. Then too there was the night we went salsa dancing because I decided I wanted to learn how to dance and Thursday night was Salsa night at a local club. I don't know why I torture myself (or others) with this continued desire to learn how to dance. I lack timing and I have no rhythm to speak of; a dance instructor was once rendered speechless by my inability to wiggle my hips ("But you're a woman! It should be natural for your hips to sway!"). But it didn't stop me from having fun at my own expense. Late night forays out having drinks and talking about everything under the sun. Exploring the city from top to bottom. And food. Oy, if there was a food run to be made, there we were. Crepes, lengua tacos, chocolates, sushi, In'N'Out burgers; cooking in San Francisco was like a slice of heaven: farmer's markets, high end grocery stores stacked with every conceivable odd item -- whatever you wanted, there you could find it. Whatever there was to be consumed, there was my cousinly cohort accompanying me or cooking with me. One particular excursion found us in Union Square searching for wedding dresses. After a morning of trying on dresses and doing mental wedding gymnastics, we considered where to eat; and Wendy said decisively, "Neiman Marcus. We need to go have their popovers." And indeed we did: with strawberry butter, the ginormous popovers were airy and delicate. It was the first time I'd ever had popovers; and until this past Saturday, the last time. That was five years ago. Another cousin has been posting pictures of her baking mania to her facebook page recently and one photo reminded me of popovers; and suddenly I was consumed with the memory of how those Neiman Marcus popovers tasted and how nice it would be to have a Saturday brunch with popovers and strawberry butter. I hunted down the Neiman Marcus recipe, which is terribly fussy: everything needs to be at room temperature before mixing and even then the batter needs to rest for an hour. It can't be made the night before so requires a just-in-time approach, which doesn't make it convenient. But oh, when those popovers came out of the oven, spilling out in soufflé-ish domes, the smell brought me back to that day in the city with my cousin and it was worth the hassle. And smeared with strawberry butter, I could almost pretend for one moment that I was back in San Francisco with Wendy -- and maybe I was. Place milk in bowl and microwave on High (100 percent power) for 2 minutes, or until warm to the touch. Sift flour, salt and baking powder together in large mixing bowl. Crack eggs into work bowl of electric mixer fitted with whisk, and beat on medium speed for about 3 minutes, until foamy and pale in color. Turn down mixer to low and add warm milk. Spray popover tin generously with nonstick spray. Fill popover cups almost to the top with batter and place popover tin on cookie sheet. Transfer to oven and bake for 15 minutes. Turn down oven temperature to 375 F and bake for 30 to 35 minutes longer, until popovers are deep golden brown outside and airy inside. Turn out popovers and serve hot with strawberry butter. Makes 12 popovers. 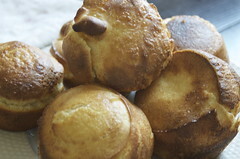 Note: Chef Garvin advises: "The key to making great popovers is having the eggs and milk warm before mixing. It is also important to let the batter sit for an hour before baking it. 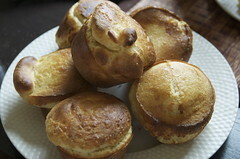 Popovers do not freeze well, and pre-made batter has a tendency not to work properly the next day." Wow what a great story. I lived in San Francisco for 5 years and I feel exactly the same way. Thanks for reminding me. Ali -- I miss SF every day of my life. I keep wondering when I get to go back? Kelly -- send it my way, sis. The NYT one was disappointing.